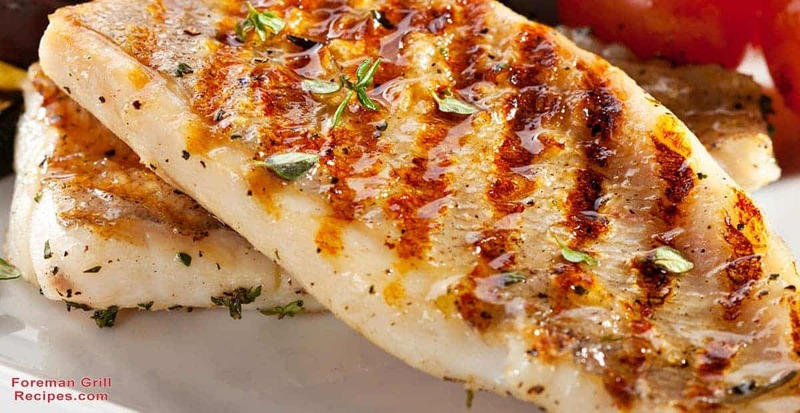 Fish is one of the easiest and best things to cook on a George Foreman Grill. River or lake trout has such a fresh, clean flavor. It doesn’t have the naturally salty or briny taste of seafood from the ocean. Fresh water trout lends itself quite well to grilling. I used to fish for trout in a local reservoir. Brown trout was what we would mostly catch. We would bring the fish home, gut and clean it, and trim off the head, tail, and fins. It isn’t a scaly fish, but it does have a lot of small bones to deal with. Given the great flavor, the bones are a minor inconvenience. I have always grilled trout, sometimes whole stuffed with herbs and lemon. I think grilling is the only way to cook fresh water trout. When I prepare trout on a Foreman Grill I either do it outside or I place the grill on my range under the exhaust hood so as not to make the whole house smell like fish. Brown and rainbow trout are similar nutritionally. They are high in omega 3 fatty acids, the good fats that we need for cardiovascular health. Trout is a wonderful source of both lean protein and B vitamins, especially vitamin B-12. B-12 is necessary for the proper function and development of the brain, nerves, and blood cells. It is also a great source of the minerals phosphorous and selenium. Another benefit of fresh water trout is that it isn’t normally high in mercury or other toxins that some ocean fish contain. Trout can be bought wild or farm raised. If buying farm raised trout, look for fish labeled organic and sustainably raised. When you visit your fish monger, ask that the trout be filleted and bones removed. Or, do it yourself if you are a handy fisherman or woman. In my experience, filets work best on the Foreman Grill. They come out flaky and what little fat there is will drip into the tray. If you have an outdoor electrical outlet, do this outside. Alternatively, use your Foreman indoor/outdoor grill. If using the indoor/outdoor grill, you will want to flip the fish half way through cooking to char both sides of the fillets. 1. Pat the fish dry. Then, coat with salt and pepper on both sides. 2. Heat the Foreman Grill to high. Coat the hot grill with butter. Place the fish on the grill skin side up. Close and grill for no more than 5 minutes. Check after 3 minutes to see if flesh flakes and is opaque. 3. Remove the filets to a plate and grill the lemon slices for just a couple of minutes. 4. Serve the trout with the grilled lemon slices on top. I always think of trout dinner as a rustic country or camping meal on a cool early summer evening. What goes really well with a meal like this is a side of fresh, sweet and sour, red cabbage slaw and a skillet cornbread. Here is a simple slaw recipe from chef Sunny Anderson that you can make ahead of time and serve under the trout. Some earthy, crushed, toasted hazelnuts would go nicely on top of both. For the cornbread, it is really nice hot out of the oven. Have this prepared and almost finished baking by the time you start your fish. 1. Preheat an oven to 425°F. Place 1 TBS of fat in a 6-1/2” black iron skillet. Place the skillet in the oven to melt the fat. 2. In a large bowl, whisk together the wet ingredients + the remaining 1TBS of fat. 3. In another bowl, whisk together all the dry ingredients. Then, add the dry to the wet and whisk until the batter resembles pancake batter. Add more milk if needed. 4. Pour the batter into the hot skillet bake for 15 to 20 minutes until golden brown. Serve hot, right out of the skillet, alongside the trout and slaw. This rustic meal brings back fond memories of catching dinner in the afternoon and eating the fish as fresh as possible. If you can’t catch your own trout, you can obviously get it in season from the market or fish purveyor. If not, trout filets are often available frozen. Just thaw them in the refrigerator overnight. Be sure to give them a quick rinse and pat them dry with paper towels before grilling. One last note: Clean your grill well after cooking fish on it so there is no residue left behind. Cleaning a Foreman Grill is so easy, so don’t be tempted to let it sit overnight with smelly fish bits on it.